The Explorer Knife's top quality assures it to be more durable and stronger than most pocket knives. Made with 440C stainless steel. 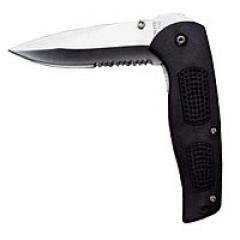 Explorer features: 3 1/2" half serrated blade for cutting, thumb stud for easy one hand opening, hard rubber inlay handle for sure grip, handy belt clip, 4 1/2" closed, 8 1/4" open. Approximately 4 oz.